1. 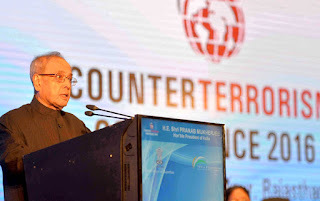 I am delighted to be amidst you this evening at the inauguration of the 2nd edition of the Counter-Terrorism Conference organised by the India Foundation in collaboration with Government of Rajasthan. It is heartening to note that this conference has brought together field operatives, senior officials from security agencies, policy makers, scholars and government leaders involved in counter-terrorism operations, planning and sensitization to discuss ways of tackling global terror outfits. 2. Peace is the primary objective of rational consciousness as well as a moral universe. It is the foundation of civilization and a necessity for economic success. And yet, we have never been able to answer a simple question: why does peace remain so elusive? Why has peace been so much more difficult to attain than conflict? These are the questions we need to ponder upon, both as a civilization and as a society. 3. As the twentieth century closed down with a remarkable revolution in science and technology, we had some reason for optimism in the direction of peace and prosperity. That optimism has faded in the first fifteen years of this century. There is unprecedented turbulence across vast regions, with alarming increase in regional instabilities. The scourge of terrorism has reshaped war into its most barbaric manifestation. No corner in the world is now safe from this savage monster. 4. Terrorism is inspired by insane objectives, motivated by bottomless depths of hatred, instigated by puppeteers who have invested heavily in havoc through the mass murder of innocents. This is war beyond any doctrine, a cancer which must be operated out with a firm scalpel. There is no good or bad terrorism; it is pure evil. 5. Terrorism is undoubtedly the single gravest threat that humanity is facing today. Whether in Paris or Pathankot, terrorist attacks on democracies are attacks against fundamental values of liberty, freedom and universal brotherhood. Terrorism is a global threat which poses an unprecedented challenge to all nations. No cause can justify terrorist acts. It is imperative that the world acts in unison against terrorism, without political considerations. Therefore, there is a need to take a resolve to not justify terrorist means whatever be the reason or the source. 6. Till the end of the 20th century, terrorism had regional or national connotations. With the emergence of first Al-Qaeda and now IS, those boundaries have shattered. Non-state actors are trying to be the State themselves, spreading radical ideologies across societies, using technologies to the fullest extent to attract youth. In such a scenario mere political and military strategies will not suffice. We need to take social, economic, religious and psychological aspects into consideration. 7. In the history of terrorism, the terrorist attack on the United States on September 11, 2001, is certainly a watershed moment. That moment defines the genesis of modern-day counter terrorism in the international context. From that single incident have flowed most of the interventions in the counter-terrorism sphere that we see happening at the international level as also at the regional and domestic levels. Faced with the spectre of terrorism, the Western world has undertaken a lot in terms of strategy and tactics and has achieved results also. We need to carefully examine and learn lessons from the success and failure of these strategies. 8. We may, at the same time, do well to remember that South Asia has been facing terrorist violence since decades in various forms. There is a peculiar nature to this terrorism. To counter that, South Asian countries, including India, have developed certain capabilities. We need to similarly discuss and deliberate on the effectiveness of these strategies and how these have impacted on our counter – terrorism capabilities. 9. An important aspect of counter-terrorism strategy is capacity building to prevent attacks through intelligence collection and collation, development of technological capabilities, raising of Special Forces and enactment of special laws. Though we have evolved certain mechanisms in this direction, there is scope for further intensifying these efforts. 10. Counter terrorism is generally considered to be about tactics, weapons, force levels and intelligence gathering. While these things are important the predominant focus has to be on the political management of terrorism. This includes addressing issues of ideology and dealing with countries that sponsor or support terrorism. It is imperative that the world in one voice rejects all manifestations of terrorism, without distinction, and proscribes States that support or sponsor terrorism as an instrument of State policy. 11. We cannot also forget the fact that civil society is both the frontier and the battleground which has to be protected and saved. Fragmentation of civil society, rather than its consolidation, is not a wise strategy. The former course leads to radicalization, which thereafter leads to competitive violence. Think tanks and civil society organizations have a larger role to play in this process of social integration. A pluralistic and inclusive society like India has long presented a model for multi-cultural living. It is for this reason that global terror outfits have not been able to find traction in India. We have, as a nation, to strengthen that plurality so that it acts as a bulwark against radical ideologies and thought processes. 12. These aspects highlight the fact that there is a need for comprehensive strategies and greater international cooperation to ward off future threats. Our counter-terrorism effort has to be more pointed, more focused, more objective and more professional. While doing so there will always be a dilemma of whether we are threatening individual liberties or human rights. We have, therefore, to be judicious in protecting larger freedoms and democratic values. We need to fight this scourge at all levels- through shaping of public opinion, society building and evolving a concerted and integrated counter- terrorism policy premised on international cooperation in intelligence sharing. Needless to say, it also entails taking concerted action to shut down the financial networks that support and sustain terrorism. 13. I am confident that this conference shall deliberate on the challenges posed by global terror outfits, and examine the possibility of sharing capabilities with a view to combating larger dimensions of this threat. With these few words, I conclude. I wish you and the deliberations of the Conference all success. 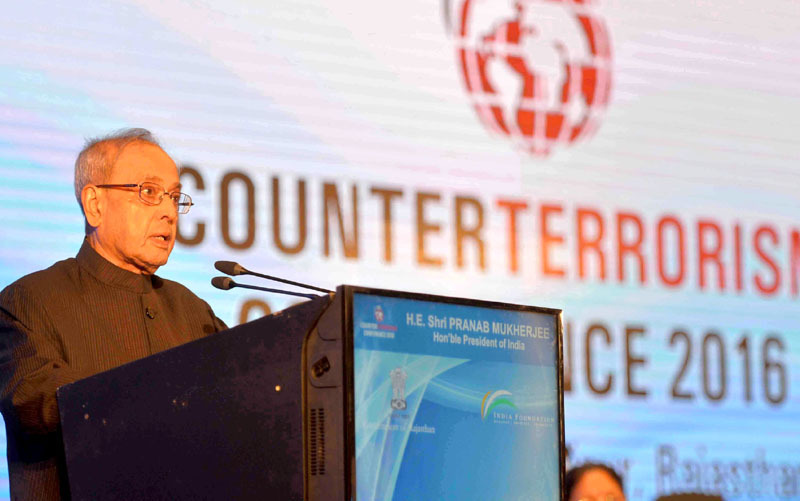 The President of India, Shri Pranab Mukherjee inaugurated the Counter-Terrorism Conference- 2016 today (February 2, 2016) at Jaipur. Speaking on the occasion, the President said that terrorism is undoubtedly the single gravest threat that humanity is facing today. Terrorism is a global threat which poses an unprecedented challenge to all nations. No cause can justify terrorist acts. It is imperative that the world acts in unison against terrorism, without political considerations. Therefore, there is a need to take a resolve to not justify terrorist means whatever be the reason or the source. The President said that an important aspect of counter-terrorism strategy is capacity building to prevent attacks through intelligence collection and collation, development of technological capabilities, raising of Special Forces and enactment of special laws. Though we have evolved certain mechanisms in this direction, there is scope for further intensifying these efforts. The President said that counter terrorism is generally considered to be about tactics, weapons, force levels and intelligence gathering. While these things are important the predominant focus has to be on the political management of terrorism. This includes addressing issues of ideology and dealing with countries that sponsor or support terrorism. It is imperative that the world in one voice rejects all manifestations of terrorism, without distinction, and proscribes States that support or sponsor terrorism as an instrument of State policy. We cannot also forget the fact that civil society is both the frontier and the battleground which has to be protected and saved. Fragmentation of civil society, rather than its consolidation, is not a wise strategy. The former course leads to radicalization, which thereafter leads to competitive violence. Think tanks and civil society organizations have a larger role to play in this process of social integration. The President said that our counter-terrorism effort has to be more pointed, more focused, more objective and more professional. While doing so there will always be a dilemma of whether we are threatening individual liberties or human rights. We have, therefore, to be judicious in protecting larger freedoms and democratic values. We need to fight this scourge at all levels- through shaping of public opinion, society building and evolving a concerted and integrated counter- terrorism policy premised on international cooperation in intelligence sharing. Among the dignitaries present on the occasion were Dr. Abdullah Abdullah, Chief Executive of Islamic Republic of Afghanistan, Shri Kalyan Singh, Governor of Rajasthan, Smt. Vasundhara Raje Scindia, Chief Minister of Rajasthan and Shri Suresh Prabhu, Union Minister of Railways. The President of India, Shri Pranab Mukherjee has extended his greetings and felicitations to the Government and people of the Democratic Socialist Republic of Sri Lanka on the eve of the 68th Anniversary of their Independence (February 4, 2016). In a message to His Excellency Mr. Maithripala Sirisena, the President of the Democratic Socialist Republic of Sri Lanka, the President has said, “On behalf of the Government, the people of India and on my own behalf, it gives me immense pleasure to extend warm felicitations and best wishes to Your Excellency and to the people of the Democratic Socialist Republic of Sri Lanka on the occasion of the 68th Anniversary of your Independence. The ties of friendship between India and Sri Lanka go back centuries and have matured over time to include all areas of contemporary relevance. I am confident that the renewed vigour in the Sri Lankan polity under your leadership will not only allow you to realize your vision for Sri Lanka but also strengthen the partnership between India and Sri Lanka for the mutual benefit of the people of our two countries. I would like to take this opportunity to assure you that, as a close friend and neighbour, we support your vision for Sri Lanka. Please accept, Excellency, my best wishes for your good health and personal well being as well as for the continued progress, prosperity and happiness of the people of Sri Lanka”. The President of India, Shri Pranab Mukherjee has condoled the passing away of Dr. Balram Jakhar. In a message to his son, Shri Sunil Jakhar, the President has said, “I am sad to learn about the passing away of your father, Dr. Balram Jakhar, an esteemed colleague and a dear friend of long years. Dr. Jakhar was a veteran Parliamentarian, having been Member of Lok Sabha for four terms (1980 to 1999) and Member of the Punjab Legislative Assembly (1972 to 1979). He was also a distinguished administrator who served the nation in various capacities. Dr. Jakhar worked with distinction as Union Minister of Agriculture from 1991 to 1996, Speaker of the Lok Sabha from 1980 to 1989 and Governor of Madhya Pradesh from 2004 to 2009. He was one of the founders of the Bharat Krishak Samaj and as its life President made immense contribution to farmers and agriculture. As Speakers of the Lok Sabha, Dr. Jakhar was instrumental in automation and computerisation of Parliamentary records and establishment of the Parliament Museum. The nation will always remember his valuable contributions and pursuit of excellence in public life. Please accept my heartfelt condolences and convey them to the members of your family. I pray to the Almighty to give you and your family the strength and courage to bear this irreparable loss”. 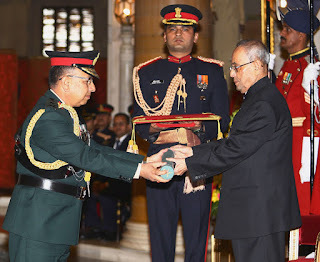 The President of India, Shri Pranab Mukherjee conferred the Honorary Rank of General of the Indian Army on Prakhyata Trisahkati-Patta General Rajendra Chhetri, Chief of the Army Staff, Nepalese Army, for his commendable military prowess and immeasurable contribution to fostering Nepal’s long and friendly association with India, at a special Investiture Ceremony held at Rashtrapati Bhavan today (February 3, 2016). The citation read out on the occasion says “General Rajendra Chhetri’s selfless service, sincere devotion and commitment to excellence are in keeping with the finest traditions of Military service and reflect distinct credit upon himself and the Nepalese Army. Throughout his exemplary career, General Chhetri has demonstrated dynamic leadership and outstanding professionalism. General Rajendra Chhetri has contributed to promote the existing bond of friendship, based on goodwill and mutual understanding, between Indian and Nepalese Army as well as other armies of the world. In recognition of his commendable Military prowess and immeasurable contribution to further fostering the long and friendly association with India, President of India is pleased to confer the honorary rank of General of the Indian Army on General Rajendra Chhetri”. Among the dignitaries present on the occasion were Shri Manohar Parrikar, Minister of Defence; General Dalbir Singh, Chief of the Army Staff; Air Chief Marshal Arup Raha, Chief of Air Staff; Vice Admiral P Murugesan, Vice Chief of Naval Staff and Defence Secretary, Shri G Mohan Kumar.